If rose is the favorite flower of your beloved then send this pleasing rose basket beauitfully arranged with gysophila and greens in India. There are 24 red, pink and white colored roses epitomizing sheer elegance. 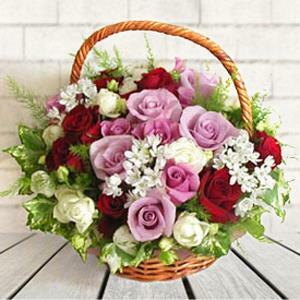 Coming with the handle, you can send this flower basket with other Gifts to India through RGCards.com.